Splat painting is a FAVORITE activity of our Orange Easel artists (and instructors). It involves throwing paint-soaked cotton balls at a wall. When the paint balls hit the wall, there's a very satisfying (and surprisingly loud) "SPLAT" sound and the paint flies in all directions. It's all of your wildest, Jackson-Pollock-wannabe dreams come true. At the end of the activity, you're left with a paint-splatter wall that makes the best photo backdrop for any party. We do this large-scale, collaborative action art as the warm-up activity for many of our artsy Birthday Parties. We splat paint with a different group of kids about 8-10 times every single weekend. We are the splat paint EXPERTS over here. Step 1 - Cover your wall in butcher paper. Understand, the paint will splatter outside of this paper. Paint splatters EVERYWHERE. We wash our walls every weekend; we have a glossy paint on the walls, and the paint wipes off with elbow grease and water. Cover your baseboards if they are white. Nothing worse than scrubbing baseboards. If you don't want splatters on your ceiling, cover it about five feet out from the wall. Step 2 - Fill containers with paint. You'll probably want to use washable paint. If you're looking to do something permanent like our speech bubble, you need to spend LOTS of time on step one. We use a washable tempera paint made by Colorations. Thin the paint slightly with water. The thinner the paint, the better the splatters. But, if you get it too thin, you'll have dripping, running paint on the wall. Think of the consistency of melted ice cream. Step 3 - Get some cotton balls. We use about 100-120 cotton balls for five cups (40 fluid oz) of paint. It usually takes our artists about 10 minutes to get through 100 cotton balls. We use regular size cotton balls, but the jumbo ones work too. Step 4 - Set up a clean up station. We think it's easier (and faster) to do clean-ups with a basin of water instead of sink. You're really just looking for "clean enough". (i.e., Clean enough to grab another cotton ball) We have a dish pan from dollar tree that we fill with a couple inches of sudsy water. Place some towels under the bucket to catch any water that gets splashed outside. Place a couple hand towels (or bath towels) nearby to dry hands. This keeps the floor safe--more on that later. Step 5 - Go over the rules. You aim at the wall (we understand that sometimes we miss). You look before you throw (no throwing paint balls at other people). We like to turn up the music really loud for this part. Our floors get really slippery. It's caused by the combination of paint splatters from the wall, paint drips from transporting the paint balls, and watery hands from artists who are too eager to dry them off thoroughly. Our instructors constantly wipe the floors with large bath towels. We're not trying to CLEAN the floors. Just dry them off! In our studio, we go barefoot for splat painting. Our paint is washable. But that doesn't mean that mom wants to wash your shoes. Action shots are really fun but hard to catch. We like to take video to catch the action. Afterwards, we ALWAYS take a group photo in front of our masterpiece! In three years of splat painting, we've cleaned a lot of walls. At the Orange Easel studio, we clean up our walls by mopping them! We have a large wet mopping pad from Norwex that we use; it reaches the high corners and the large scrubbing pad covers a large surface area on every swipe. If you splat paint, we'd love to see that photo that you took...send it to us so we can see your masterpiece! Here's a fun portrait activity for preschoolers and young elementary artists. It's a great way to reinforce the placement of facial features on future portraits! It's also silly and captivating for a young audience. For you teachers out there--it uses very basic supplies and it easy to set up and take down. For our classes this week, we taped color photos to the table using clear packing tape. The photos are just printed from a google image search. You could also use photos from magazines. An alternative to the packing would be to laminate your printed pictures or to place them in plastic page protectors. We set up our tables prior to the start of class. All that's left to do is play! Using dry erase markers, the artists can trace eyes, noses, mouths, ears, eyebrows, hairs, etc. Just for fun, we also added mustaches, glasses, hats, and other accessories! We erased our drawings with colorful pom poms! There were so many giggles during this drawing activity. And some really wonderful conversation. Some of our artists added accessories to the portrait but many of them simply reinforced the features that were already there...tracing over the eyes, coloring in the mouth, following the path of the nose, etc. ​It was a playful and non-intimidating way to introduce portraiture to our class! I hope you get to try it out in your room! This is the first post in a series of a LONG line of posts about treasures we find at the dollar store. Some of our best "art" supplies come from Dollar Tree! First up...cookie sheets! We love 'em. We use them for all sorts of things. Especially when it comes to organizing our activities. Check out the EIGHT different applications below! Crayons are easy to see, share, and select! Tell us below in the comments...What would you use them for? With Halloween around the corner, we're doing quite a bit of dress-up play in the Orange Easel studio. Wait...what? Dress-up? Is this ART??? Playing dress-up exercises the imagination through role playing, acting, and plot development. Done properly, the game of dress-up demands a large selection: garage-sale-treasures, out-dated accessories, old Halloween costumes, and dance recital dresses. But, we believe that the dress-up bin has the potential to include a variety of homemade (CHILD-made) items. There's the possibility for CREATION. And THAT is the Art. These are the types of invitations we're setting-up this month in the studio. Yes, there's still an Ironman costume, and a tutu, and a sword and shield. But where the supply is lacking there's the possibility of creation too. Encouraging the children to make their OWN costumes for play fosters an attitude of self-sufficiency, confidence, and independence. So, ORANGE EASEL doesn't have an Elsa costume? Let's make one! One of the best gifts we can give our children is the belief that they can be MAKERS. If something isn't accessible, they can MAKE it exist. If something isn't readily available, they can FIND it and MAKE it. We are called to be makers...inventors, creators, and problem solvers. Make it. And be proud of what you've created. These handmade articles should be kept alongside our manufactured items and given the same value, if not more. Below is a list of dress-up play items to get you started creating items for your dress-up bin. Make a few with the kids to get them started THINKING about costume creation. Once they know it's a possibility, they'll be coming up with their own patterns and designs! This is an easy mask from Picklebums that we're doing this month with our preschool classes. The cardboard egg cartons are a wonderful material to paint on! Our little artists are having fun adorning them with glitter glue, gemstones and feathers. All you need is an old tshirt and some scissors to make a new cape! So many animal options. Just a paper plate and an imagination! Can you imagine a herd of these creatures running around the house? And roaring? Maybe this could be just the beginning? Next, dragons. Or unicorns. Paper plates can become crowns, alien antennas and more! Toilet paper rolls become watch bands in this costume creation. Where would your kids fly with just a couple soda bottles and some duct tape? Teach your kiddos how to make these vest and there's no limit on what costume they can create! Check out the adorable Tiger costumer from Home With The Boys. Glittering wands are the perfect accessory for ANY costume. As a bonus, these wands are guaranteed to double as swords. 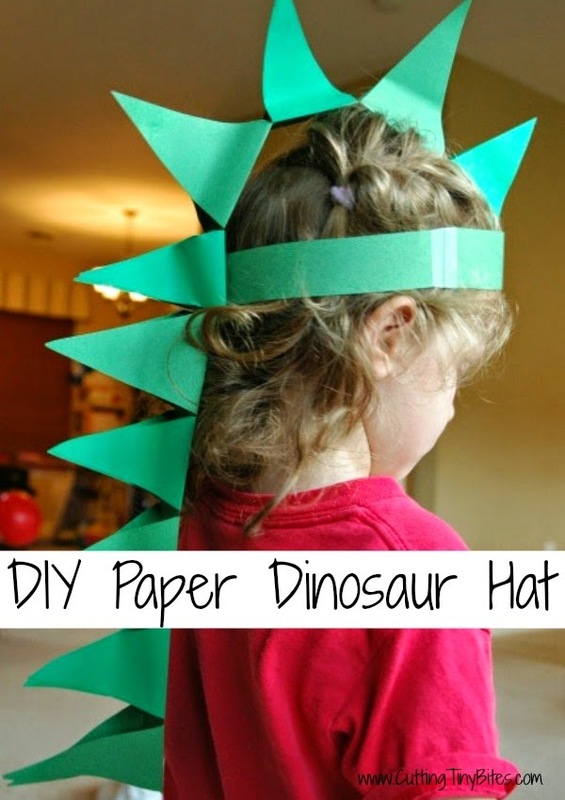 Pretend to be a head chef or award-winning baker with a simple paper hat. If your kids really get into making costumes, you can encourage this creativity and independence: keep a stash of recyclables, scrap fabric, old clothes, construction paper and craft supplies near your dress-up station! What's the favorite item in your dress-up bin? Local schools were closed today so we took advantage of the "FREE" day to be creative for a full SEVEN hours! We spent ALL day making stuff. We doodled on the tables (covered with paper), threaded beads onto bracelets, made a large under-the-sea mural, practiced drawing facial features--because practice makes us better drawers--and then painted a colorful self portrait using ONLY the primary colors (and white). We even played a few games. What a fun bunch of young artists! Check out our 90-second video showcasing *some* of the art we made! Camp schedules will be posted by Wednesday October 15th. Families currently on auto-enrollment may sign-up for camps beginning October 15th. Registration opens to the public on October 22nd. Get on our mailing list to be notified whenever camp registrations open! Sensory play includes any activity that stimulates your young child's senses: touch, smell, taste, sight and hearing. Sensory activities and sensory tables facilitate exploration and naturally encourage children to use scientific processes while they play, create, investigate and explore. Toddlers and preschoolers need MANY MANY opportunities to get hands-on. We learn through our senses...the more the better. Feel it. Hear it. Smell it. See it. Sensory play allows for self-discovery. The open-endedness of it encourages imaginative play and problem solving. Adults may not see "the point" of this type of play, since nothing is created or produced. The child dictates the play that happens based on what he or she NEEDS to learn...cause-and-effect, the concept of filling-and-emptying, small world reenactment, etc. Manipulating the sensory materials and tools also develops motor skills needed for future writing. Scooping and pouring requires core strength, shoulder stability and wrist rotation. They aren't many. There's no WRONG way to play in a sensory bin! Let the play evolve. It will be different with different children and ages. Scooping and pouring is just the beginning. Add figurines and watch the imaginative play that happens. Rice becomes dinosaur food. Feed corn becomes the "water" that fills the toy swimming pool. It's easy to think that this type of play is only for the five-and-under crowd, but we encourage you to rethink that. Older children enjoy this type of play JUST as much as the little ones. Give them permission to explore and play. They are still kids too. Follow Orange Easel School of Art's board Preschool Sensory on Pinterest. We love the sensory experience of all the seasons at Orange Easel. This playdough smells like Fall--give a fresh batch to the kiddos to play with and it works better than any scented candle or plug-in to make your home smell yummy! Mix all ingredients in a saucepan. Heat slowly on stovetop, stirring constantly. Once the dough forms and mixture is no longer sticky, remove to counter top and knead with flour until smooth.